This tasty Keto Lasagna Meatloaf is perfect for your picky eaters, and even sneaks some healthy veggies in there! Shhh – I won’t tell if you don’t! Low carb and gluten free. Combine the ground beef, 2 eggs, salt, pepper, garlic powder and onion powder in a medium bowl and mix well. Sprinkle the spinach into the well. Combine the ricotta filling ingredients in a medium sized bowl and mix well. Spoon over the spinach in the well and spread evenly. Sprinkle the mozzarella cheese evenly over the top of the ricotta mixture, but don’t get it on the edges of the meat mixture. Form the Italian sausage into a flat rectangle that is close to the size of the top of the pan. Lay the sausage over the top and press firmly down on the edges to seal it into the ground meat layer. Cut three small round vent holes in the top of the meatloaf. Place on a cookie sheet to catch any drippings. Remove from the oven and rest 30 minutes before slicing with a sharp knife. 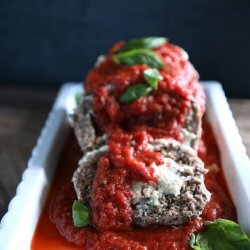 Top with warm Easy Keto Marinara Sauce to serve. Approximate net carbs per serving = 2g. I neglected to line my loaf pan with foil first, and I recommend doing so because it makes it easier to remove the meatloaf after cooking. Alternatively, you can get this genius loaf pan with a lift out insert for meatloaf on Amazon, which I’ve already got in my cart and can’t wait to get my hands on!